DealerRater, the car dealership review website for consumers, has announced the winners of its annual Dealer of the Year award program. At Porsche Riverside, we’re excited to share that, for another consecutive year, our dealership was named the Highest Rated Porsche Dealer in the United States! 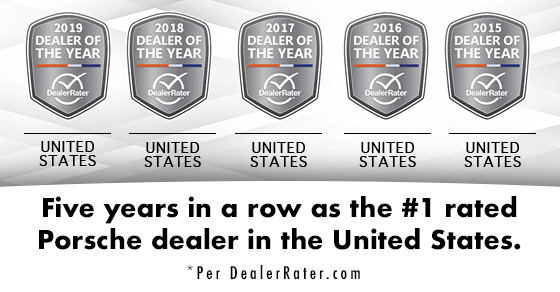 DealerRater’s Dealer of the Year awards recognizes dealers for distinction in outstanding customer service, based on reviews of dealership experiences shared on DealerRater.com. DealerRater’s Dealer of the Year awards are given annually to the top U.S. and Canadian car dealerships. To determine award winners, DealerRater looks at the dealership’s DealerRater star rating, as well as the total number of reviews written about the dealership during the calendar year. Categories for scoring include quality of work, friendliness, pricing, customer service, and overall experience. At Porsche Riverside, we strive to create the best possible customer experience and are proud to be recognized by DealerRater for our efforts. Our dealership is once again not only the #1 Porsche dealer in California, but also #1 in the United States among all Porsche dealerships! We have received this award for the last five years in a row. At Porsche Riverside, we’re proud to serve Los Angeles, Rancho Cucamonga, and Ontario area Porsche enthusiasts. 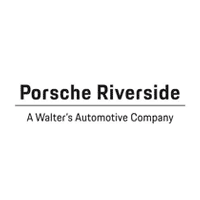 To learn more about our dealership, contact Porsche Riverside at (866) 387-0766.